This tablet is based on the Tab 2 A7-20 and has a price of just $110 USD, currently targeting the Indian market. 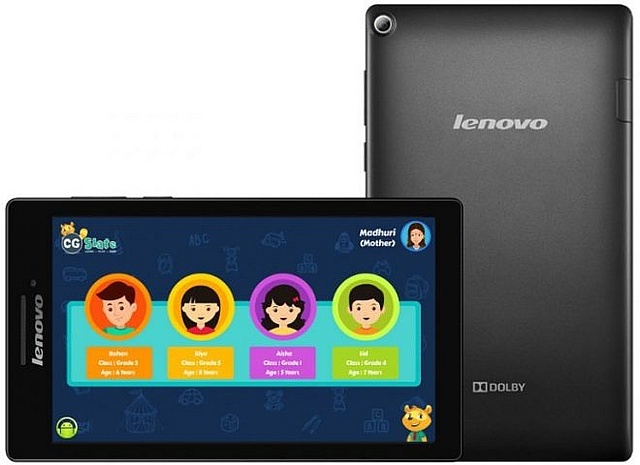 Earlier today, Lenovo and edutainment company ConveGenius have unleashed the CG slate tablet for kids. Launched targeting only the Indian market for the time being, this affordable slate is, in fact, the Lenovo Tab 2 A7-20 with a rich set of educational content and apps pre-installed. The CG Slate is powered by a 1.3 GHz quad-core processor, next to 1 GB memory and 8 GB internal storage. There are no specs to draw the attention of a potential buyer since the slate has a 7-inch IPS display with 1,024X600 pixels, a 0.3 MP camera for selfies and a 2 MP main image snapper, all with Android 5.0 Lollipop on top. The tablet is powered by a 3450 mAh battery and integrates apps like Learn Zone or Play Zone, as well as parental control. Lenovo CG Slate can be acquired from Flipkart, where it is only available in an ebony finish and currently has a price tag of roughly $110 USD.